People mourn near the Olympia shopping center where a shooting took place the day before, leaving nine people dead in Munich, Germany, July 23, 2016. In addition to suffering from depression, "the suspect had fears of contact with others," Steinkraus-Koch said Sunday. 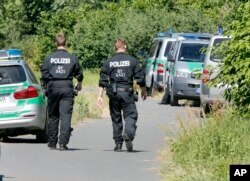 Bavarian investigator Robert Heimberger said the shooter took photographs when he visited the site of a previous school shooting in the southwestern German town of Winnenden. Heimberger said Sonboly probably bought his illegal weapon on the internet and added that he was an avid player of shooting video games. Guns are tightly controlled in Germany and authorities investigating precisely how the shooter obtained the Glock 17 handgun used in the attack. Bavaria's top security official says Germany's military should be able intervene in crisis situations like Friday night's shooting rampage at the Munich mall. German Interior Minister Thomas de Maiziere vowed to review Germany's gun laws after an investigation into Friday's attack. "Then we have to evaluate very carefully if and where further legal changes are needed," he said. FILE - Police officers walk to the crime scene near the river Main, background, where a 17-year-old man from Afghanistan was shot the night before, in Wuerzburg, Germany, July 19, 2016. Stephen Szabo of the Transatlantic Academy at the German Marshall Fund of the United States, told VOA the Wuerzburg attack, followed by the Munich shootings, will focus new scrutiny on Germany's policy of accepting refugees fleeing world trouble spots. Meanwhile, the southeastern European territory of Kosovo is having a day of mourning Sunday for three ethnic Albanians who were among those killed in Munich. Flags are at half-staff at all public institutions. Two other Albanians of Kosovo origin were also wounded.